For years, whenever you needed a dental crown (cap), your dentist had to make molds of your teeth which required taking an impression of your teeth. A tray filled with a goopy, putty-like material was used so that a three-dimensional model of the prepared tooth could be created. Using this mold, a dental lab could custom-craft the new crown. However, as we journey further into the technology-driven 21st century, this traditional methodology is being replaced with virtual models — made using small, handheld “wands” that employ a digital camera and some reflective dust. The initial phase of restoration, preparing the tooth surface, remains virtually the same. First, any dental decay must be removed, and the remaining tooth must be shaped so that a crown or filling can be fitted properly. This will allow the tooth to be restored to its original shape, look, and function. 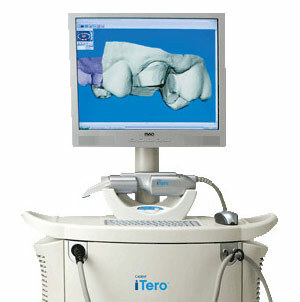 Next, the area is lightly dusted with a reflective material (not a goopy impression material) so that multiple images of your tooth's surface can be recorded with a small scanning wand. Later, the computer component is connected to the scanning wand and these separate images are combined into a computer-generated 3D image. This remarkable tool uses blue wavelength light to precisely capture the unique nooks and crannies of your tooth's surface and make a highly accurate 3D digital model. 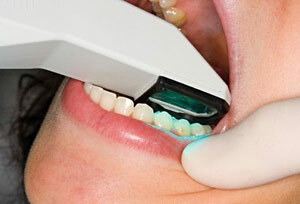 It makes it possible to instantaneously examine your tooth, and your bite. It's possible to identify any additional prep work required for new crowns, veneers and fillings right then and there; to implement any needed changes; and to rescan the tooth to create a new series of images and 3D model. Once the image capture and prep work are satisfactory, your images are sent on to the lab for fabrication. This technique makes it possible to create a crown or a filling that can often be completed during a single office visit. Finally, you can say goodbye to the goop, gagging, discomfort, and anxiety you've experienced in the past with traditional dental impression materials! It enables the immediate assessment of whether or not your tooth has been properly prepared for restoration. This technology is ideal for fabricating restorations such as new crowns, veneers and fillings for teeth — often possible in one office visit. It takes less time than traditional dental impressions.